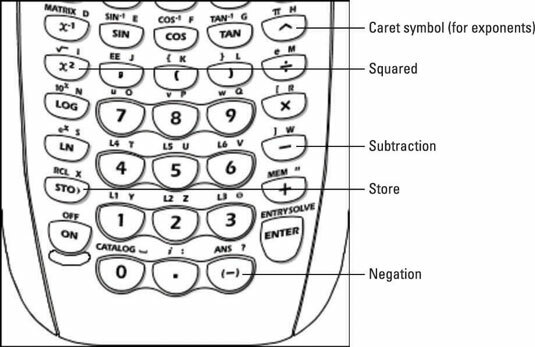 Arithmetic expressions are evaluated on the TI-84 Plus Home screen. The Home screen is the screen you see when you turn the calculator on. 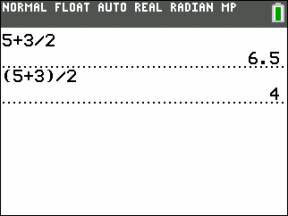 If the Home screen is not already displayed on the calculator, press [2nd][MODE] to display it. If you want to clear the contents of the Home screen, repeatedly press C until the screen is empty. Repeatedly pressing [CLEAR] doesn’t delete your previous entries or answers — it just removes them from view! Press the up-arrow key to scroll through your previous calculations. When a previous entry or answer is highlighted, press e to paste it into your current entry line. Arithmetic expressions are entered in the calculator the same way you would write them on paper. If you use the division sign (/) for fractional notation, it’s usually a good idea to use parentheses around the numerator or the denominator, as illustrated in the first two calculations. There is a major difference between the subtraction key [-] and the negation key [(-)].They are not the same, nor are they interchangeable. Use the [–] key to indicate subtraction; use the [(-)] key before a number to identify that number as negative. If you improperly use [(-)] to indicate a subtraction problem, or if you improperly use [–] to indicate that a number is negative, you get the ERR: SYNTAX error message. The second screen is the result of pressing [ENTER] on the first screen. Simply press  to automatically bring your cursor to the cause of your error where you can edit the entry as needed. Do not use commas when entering numbers. For example, the number 1,000,000 is entered in the calculator as 1000000. See the third screen. After entering the expression, press [ENTER] to evaluate it. The calculator displays the answer on the right side of the next line.